A new virtual reality (VR) system hosted in a lab at the Bauhaus University in Weimar, Germany allows the life-size images of up to six people to be beamed to distant locations and recreated in a virtual space – in 3D and in real time. Not only does this mash-up of telepresence and VR promise to make long-distance communication more immersive and fun; it is already being applied to an archaeology project that could help reveal the ancient secrets of European rock art. 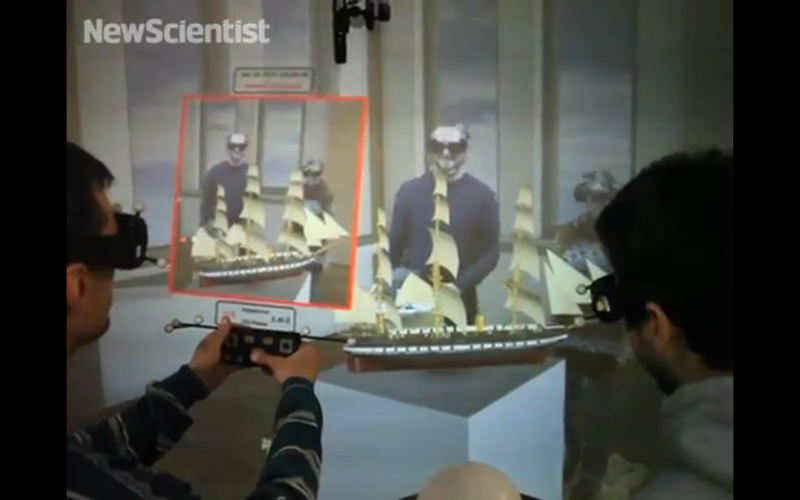 To create a multi-user VR system, up to six people must wear bespoke 3D glasses and stand in front of a large screen, onto which 3D images are projected. Unlike a 3D movie, where everyone in the audience sees what is projected on the screen from the same angle, the Weimar team’s system takes into account your position relative to the display. Sensors on the glasses track each individual’s location, movement and even the tilt of their head. In a demo of the system, six participants inspect a full-size projection of Michelangelo’s David. Each only sees the perspective that is appropriate to their location, so if they move from left to right, their view of David‘s profile changes, as if they were walking around the real statue. They can also see each other and interact with the display together, by pointing to it or by manipulating the virtual objects and environment using a tabletop trackpad.